Aftermarket Panasport style wheels for only $689! Triumph TR8 w/ 15x6 Hyperblack Wheels. Great quality, the wheels look fantastic. The Wedge Shop is excellent to deal with, thanks Woody & Clint. It took a while to get these wheels installed, but they look great. They really add to the looks of the car quite a bit. These are beautiful wheels, they are light and look great on the car. 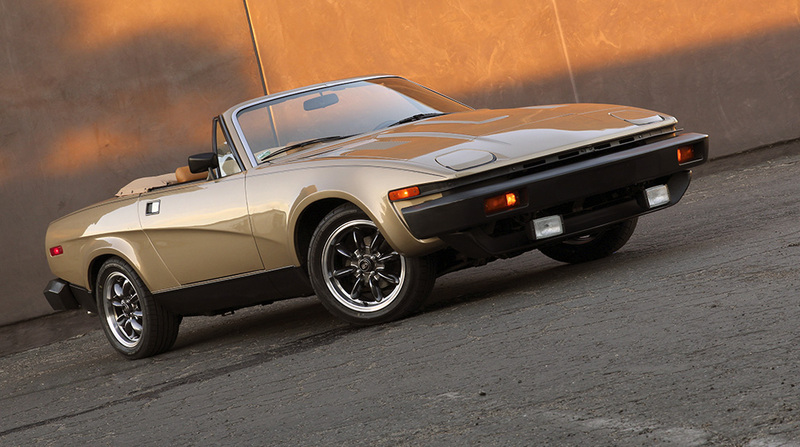 If you're like most of us TR7/8 owners, you know you can't get good 13" tires anymore. This is the perfect way to go to 15" tires, they bolt right up, no adapters, no changes except for the lug nuts (come with the wheels) which look great too. Really like the look, will make my car look great. Transform the look of your Wedge . .
After consulting with Woody, I ordered the 7X15" wheels in silver, they are stunning & high quality. They arrived at my Washington State shipper in 3 business days. Installed 205/50/15" tires, no interference. Don't replace your 13" tires, just get these rims and buy 15" tires, you won't be sorry. Woody's lugs work great, you need them. What a difference 4 wheels make! I bought these wheels to replace the stock 13's because I was changing the brakes. Clint suggested hyperblack and they look amazing with my black car. As mentioned in another review, I don't think it's imagination, these wheels and my Toyo's drive like it's on rails. Did I mention they look amazing? Very happy. The new wheels look great. I realized I needed new lug nuts after attempting to install the first wheel. The stock nuts only work with the stock wheels. It might be just my imagination but the car seems to ride and handle a little bit better. I'm happy with the purchase. The wheels now have new tires and are on the car but the engine is still in the development phase. I love the look and fully expect great performance from the wheels. I'm very close to the supplier and the wheels arrived the same day they were shipped! They arrived in perfect condition and look great. I haven't had a chance to mount tires and install the wheels yet but out of the box, I am very pleased with them. Click the button below to add the Aftermarket Panasport style wheels 15x7 & 15x6 4x95.25 to your wish list.